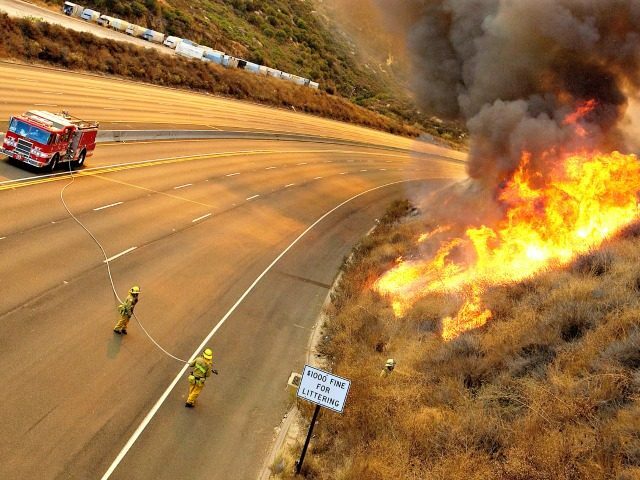 The latest blaze comes after some of the thousands of people who fled Southern California’s huge wildfire were being allowed to return home, and traffic was flowing Monday on the major highway through the area after a closure of several days. Mandatory evacuations remained in effect in many other areas. however, including the entire cities of Malibu and Calabasas. The Woolsey fire grew to more than 143 square miles with 20 percent containment as of Monday morning. The estimate of destroyed structures was raised to 370, with only 15 percent of damage assessments completed. The death toll stood at two. Spot fires continued to occur late Sunday afternoon near the Malibu campus of Pepperdine University, where 3,500 students were sheltering in place. The university said it was closing the Malibu campus and its Calabasas campus to the north until Nov. 26, but classes would be remotely administered online and through email. At least 31 people were confirmed dead in the wildfire that turned the Northern California town of Paradise and outlying areas into hell on earth, equaling the deadliest blaze in state history, and the search for bodies continued Monday. Nearly 230 people were unaccounted for by the sheriff’s reckoning, four days after the fire swept over the town of 27,000 and practically wiped it off the map with flames so fierce that they melted metal off cars. The dead were so badly burned that authorities brought in a mobile DNA lab and consulted forensic anthropologists for help in identifying them. Increasingly exhausted and dispirited, friends and relatives of the missing checked hospitals, police, shelters, and the coroner’s office in hopes of learning what became of their loved ones.